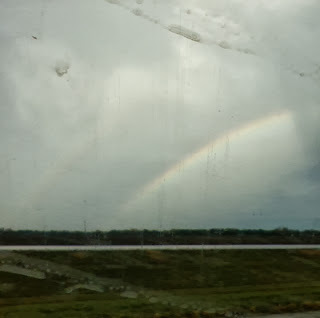 Ugly weather, but beautiful rainbows! Well, I lived! Actually, the race this weekend went very well; probably better than it should have considering my last few weeks of training. I had a great time hanging out with my parents and E, though I was a bit bummed Leo couldn't join us. E and I had a very windy and rainy trip to the race on Friday evening. I felt bad for all of the 5k runners that night, especially if they had to run against that wind. On the plus side, we did get to see a beautiful double rainbow. (That's like the symbol of God's covenant times two!) Once we made it to town, we had supper with my mom and dad at the Ground Round and had a quick visit with my aunt and cousin, who had just run the 5k. My pre-race meal was a nutritious combo of a turkey pretzel sandwich and tater tots. Seriously. I couldn't believe they had tots! Placing - Overall: 47th out of 184. Females: 10th out of 70. The marathon was small, but not bad at all for their inaugural year! The day was cool, wet, and windy, especially on the homestretch from mile 20 on, but I would take that any day over the Boston 2012 heat and humidity! By the end of the race, I was totally drenched but, fortunately, rather numb. I didn't notice how cold it was until crossing the finish line and wandering around on a search for bagels and choco milk. I was meditating on Psalm 20:7-8 the morning of the race. We can't make it through any challenge in life, whether it's physical, emotional, spiritual, or mental, without God - every day I need to remind myself to surrender to God. You can stand firm only in Him; trusting in worldly things will get you nowhere. 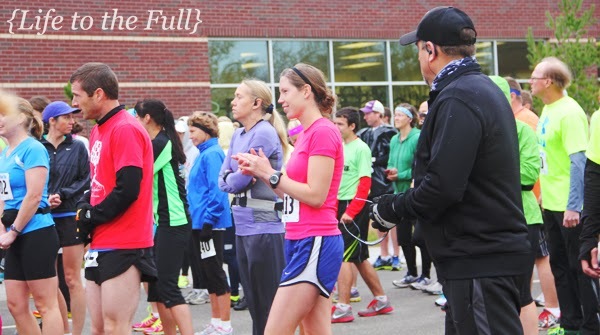 Without God, I definitely wasn't going to finish this marathon! Standing at the starting line waiting to take off was a bit uncomfortable due to the mist, cold weather, and wind, but, once we took off, the cold was very refreshing! I always aim to hold myself back for the first half of a marathon, but decided to just roll with it this time. Since having E, I wasn't sure what to expect from my body when running this distance; either I was going to run a nice time or completely bonk later on and not be able to finish. Having a race goal time seems to be the norm for runners, so not having an exact goal time felt funny. I was asked a few times what I was shooting for and all I could say was "Who knows. Something between 3:30 and 4:00 I hope!" I didn't want to set myself up for postpartum marathon failure, but my competitive side always hopes for a nice finish time. For the first 16 miles, my pace hung between 7:45 to 8:15 per mile. 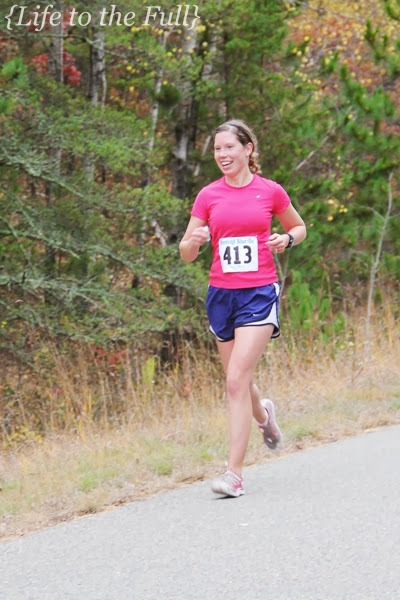 I met another runner who was running at a similar pace and it helped to stay consistent. Both him and I were running faster than we had planned, but figured we could face the consequences later. Sidenote: For the first 6 miles, I was stuck behind a guy with awkwardly short shorts (no, not the guy in the above photo). Not just "Daisy Duke" short, but SO short that part of his behind-region was exposed with each stride. Yep. Awkward and gag-worthy. Fortunately, I got brave enough to pass him and escape the situation. My mom, dad, and E camped out at a few different places along the course to say hi to me and to hand me another Clif Bar. Fueling was NOT a strong point for me this time around. While on the longer training runs, I ate random granola bars (brilliant, huh?) I found in the house and definitely had some G.I. issues. GU gels have always worked well for me, but I wanted to move away from them and try a more natural source; I just hadn't had the chance to figure out what "natural source" I was going to use as a substitute yet. So, once race day rolled around, I decided to try eating small bites of Clif Bar during the race. Fortunately, they sat well with my stomach and I didn't have to make any pit stops! Running solo after the pack spread out. They did hand out GU gels at two aid stations along the course, so I also tried those out. To any first-time marathoners: DO NOT try random new fueling strategies during your race! For some reason, I was really laid back/reckless in this marathon and was totally cool with making bad racing decisions. I learned two things from eating those aid station GU gels: 1. GU is still the best fueling option for me and 2. Mandarin orange and Strawberry banana GUs are not very appealing in taste, but they get the job done. This race report is getting a bit too lengthy now, so I'll try to rap it up. Basically, I fully arrived in the "pain cave" at about mile 20. Why? Probably because I only did one 20-miler in training - shame on me! 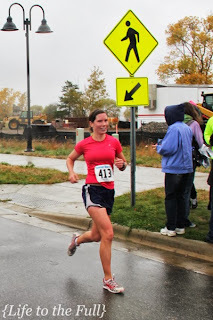 To make it through the last 10k of the race, I zoned out and put one foot in front of the other. Finishing the last 6.2 miles is definitely a matter of the heart. Looking at the course map, I must have been completely unaware of any hills earlier in the race, but I was 110% aware of the hills in the last 20+ miles. For a couple of them, I power walked up and ran down; just anything to keep moving forward. While I was drenched and just trudging along, a random mishmash of thoughts ran through my head. "A warm, cozy, dry bed sounds really great right now." 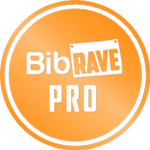 "I miss my husband (I was secretly hoping he would teleport from home to the finish line)." "This is less painful than childbirth, yet more painful than walking. Hmm." Though, I have to say marathoning and childbirth may be a different type of pain, but the mental game is near identical (in my opinion)! I'll have to write more on this later. "I can't wait to cuddle E. I hope he's not driving my parents crazy." "I could use some hot coffee right now." "Pizza? Cheeseburger? Anything but GU?" I sang worship songs in my head, mainly "Now and Forever" by One Sonic Society. I thought about how much life has changed since I was attending college in this town and how I would never want to go back to life 4 years ago! I'm so thankful God is patient and didn't see me as a lost cause! God has taught me and changed me so much in the last four years. Especially during the seemingly hopeless parts of a run, I can't get away or distract myself - it's just God, me, and the road! It's forced me to face the tough issues in life, rather than running away from them, and truly just surrender all the wonderful junk I try to hold on to. Focusing on God, my family, thoughts of warm food items, and the encouragement of an awesome fellow runner and my family carried me through the tough parts of this race (and life in general, too). Yeah. Almost there. 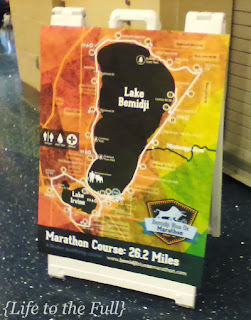 Pretty much from mile 23 and on, everyone on the sidelines kept telling me "You're almost there!" It made me wonder, what does "almost there" mean to you? I knew the marathon was required to be 26.2 miles in length, but I almost wanted them to tell me how many more strides are left. How many more turns? Any more hills? Maybe I don't still have a 5k to run?? What is this "almost there" you speak of!? I guess I'm kind of a pedestrian; just "walking" a bit faster than usual. "Almost there" means, well, almost there. It's a relative statement. To an ultramarathoner, almost there could mean you only have 26 miles left to run! For a regular ole marathon, after running 23 miles, you better not quit in the last 5k of the race (unless seriously maimed or unconscious). What a waste of 23.1 miles! So I picked up the pace to 7:45~8:00/mile to finish strong and make up for lost time in the hilly parts. Crossing the finishing line felt great and I was very happy I didn't completely fall on my face. I'm always paranoid about biffing it in the home stretch because I usually feel numb and jelly-like at that point. My legs just don't listen anymore. We hung out and listened to the half marathon and marathon places, enjoyed the feeling of sitting for a while, and then went on our way. The four of us made a coffee pit stop at the amazing Cantabria Coffee and then headed to the hotel for a very necessary shower. 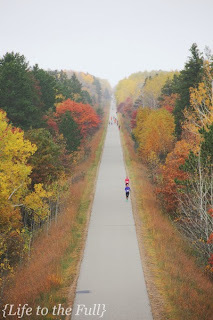 Overall, the Blue Ox Marathon went way better than it ever should have, considering the randomness of my training and picking a sinus infection two weeks prior! THANK YOU to my mom and dad for taking care of E all morning, hanging out with us this weekend, and for the great pictures my mom took. And, of course, thanks to Leo for being so supportive, even if he thinks I'm slightly crazy! So cool that you got all those pretty photos! I think it will be fun when we can start running together! That would be so exciting!!! That's definitely motivation to get the jack hammering work done - I can't even imagine trying to work with a jack hammer with a pregnant belly :s Perfect play place for kids. Congrats on a great race! 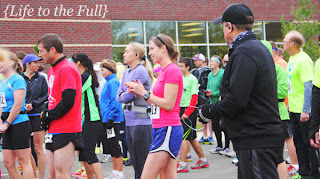 We had the same mantra with relying on the Lord to pull us through the last 10K. I told my mom that it wasn't my strength at that time, it was Him carrying me through. The course looks beautiful for this race!! Another reason to praise God! Thank you and that's so true - without God we wouldn't be able to do anything! It's so awesome to spend that time in God's creation; despite the rain and wind, the fall leaves were still beautiful! Amy, you rock! You are such an inspiration to me. I miss you and miss our runs together. Hugs! Thanks, Elizabeth! I miss seeing you and our runs together, too... 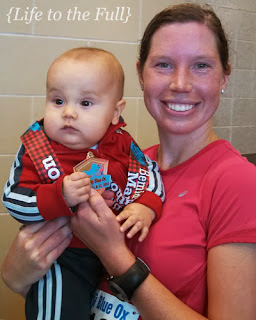 I hope we can get together in TRF one of these days :) Maybe even go for a jogging stroller run with Lizzeth and Eli. I love reading race reports! I've been at races before where guys are wearing shorts that are just TOO short. I did a triathlon last summer where two guys were teeny tiny Speedo shorts for the entire thing! It was horrifying. Sounds like you kept a good pace throughout and did well overall, congrats!